We’re at that time again, and it didn’t seem like it took that long to get here. Fall has fallen, and we keep tumbling toward the end of the year like no one’s business. And since today is Halloween, it seems only fitting to keep it like last year’s post, what with terror a somewhat expected element. So, the blogger otherwise known as the Scientist Gone Wordy and I will close out the year of 2012 with the last of our reviews in parallel. For this month, the wordy one will examine a work of frightful suspense by the husband and wife writing team known as The Gordons. Mildred and Gordon Gordon wrote a number of crime fiction novels from the 50s through the late 70s (till the year of Mildred’s death in ’79). A brief synopsis of the film: Hard working bank teller Kelly Sherwood is accosted one dark night in her garage by an asthmatic psycho, and in the most frightening and personal way. Garland “Red” Lynch has only one demand, and a couple of options if it doesn’t happen the way he wants. Steal $100,000 from the bank for him, or Kelly, and/or her sister, are killed. Simple, and there better not be any cops involved. Lynch will use a campaign of terror to keep the teller unsettled in this cat-and-mouse game. He forces her to go through with an elaborate robbery scheme, one that FBI agent John Ripley suspects is amiss. He advises Kelly to play along with the killer in the hope to capture this dangerous criminal with a minimum of bloodshed. I have to admit watching this movie once again threw me back in time. Not so much because the film reached its 50th anniversary this year, but how I first came upon it. One of the oldest independent TV stations in Los Angeles was KHJ-TV Channel 9 (1951 – 1989). Back when its signal was analog, it ran The Million Dollar Movie series, and in the early decades would showcase one film during an entire week. Run it each evening, in actuality, Monday to Friday. Somewhere in the mid-60s, I actually caught this film’s climatic ending one night after turning the television dial. I became intrigued, came back to it a day or two later, and watched the whole film, with grandmother along side. Experiment in Terror remains one superb, taunt little thriller, even decades later. Sadly, it’s one that fewer and fewer movie fans seem to remember these days. Likely considered mild in today’s light, it retained a distinct terrorizing nature in its storytelling and craft that only a few films of the period seemed to possess. I’d say Hitchcock’s Psycho, two years earlier, was an influence. However, Blake Edwards‘ film went more for suspense rather than shock. The production no doubt benefitted by the fact that the writing team of the Gordon’s transcribed their novel to the screen themselves. The film has proven influential in its own right. As others more astute than I have pointed out, this was a departure, as well as a return, for director/writer Blake Edwards, having come off the bright success of Breakfast at Tiffany’s. 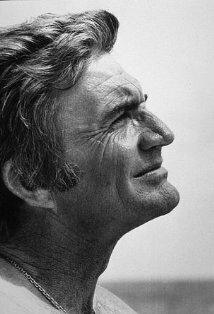 The filmmaker always had a wonderful touch with comedy and music (as Operation Petticoat of recent past and his triumphs with the Pink Panther film series shortly to come proved). Yet, the latter would be in this, the return to his noir roots (the still under appreciated TV series Peter Gunn, 1958-61, under his belt). This film would initialize Edwards’ talent beyond what viewers had come to expect. The stark and sobering drama The Days of Wine and Roses would arrive next and seal it. The first twelve minutes of Experiment in Terror are nothing short of extraordinary, too. Anyone familiar with Film Noir will instantly recognize the distinct lighting utilized. The entire sequence draws its whole energy from the darkness and the sheer black in its scenes. Director of Photography Philip Lathrop well-focused black and white cinematography, his noirish use of shadows and contrast, really made it all stand out. Along with the up/down angles he and Edwards used in photographing the principals, you had thoroughly moody visuals that only enhanced the whole film. Still, that first sequence by the director, along with the acting, its tone and threat, and the unexpected twist our heroine receives for her trouble at the other end of the phone, made it quite something. The tightness and anxiety the story generated was wholly due to the film’s cat and mouse nature, one that only added to the overall mood of the piece. What I think is the film’s secret is that Kelly (a wonderfully stunning Lee Remick) is the mouse in between the two cats in the tale (so to speak). The confident psychotic (who until the end, was always a step ahead of everyone) and the FBI, as depicted through Special Agent Ripley, the always solid Glenn Ford (his comb-over hair style, something I really noticed this time around, I’ll just leave alone). Every scene she’s in really draws the audience’s eye, much like the really wonderful supporting role Stephanie Powers debuted here, but Remick’s true talent was that she seemed the only one we could truly empathize with. Two other characters were distinguishable in this. Ross Martin’s superlative “Red” Lynch had the other remarkable, and quite human role, here (and why his and Lee’s character introduction at the beginning of the film remain the film’s most astonishing scene). Martin, who would go on to a very good character actor career on television (especially as Artemis Gordon in The Wild Wild West) before is too early demise in ’81, was so good in the role he set the stage for another bayside psychotic killer the next decade over. Don’t tell me you can’t see Andrew Robinson birthed the ‘Scorpio Killer’ in Dirty Harry from this? The other would be the city of San Francisco herself. I firmly believe Experiment in Terror used Baghdad by the Bay quite effectively and as a vanguard. The story is so centered on the city (it’s what attracts Kelly’s eyes crossing the Bay Bridge at the beginning of the film), as to be dark luminary of the story, in fact. Henry Mancini’s score was the final puzzle piece to what separated this film from others. Before the likes of John Williams, James Horner, and Hans Zimmer of the current era came to dominate movie scoring, there was Mancini. “The evocative chilling score by Henry Mancini is absolutely one of his best.”, as Dan Ireland so eloquently stated, and really set the ambience for the film. And no less influent. Compare his theme here to a certain and renowned opening piece by Angelo Badalamenti, Falling, and it won’t be hard to spot Henry’s pull on the later David Lynch television series. Don’t believe me? Where does the character of Kelly live in San Francisco? That’s right, Twin Peaks. Truly, Blake Edwards’ dark little film was at the forefront in his inky distillation of a crime thriller (care of The Gordons). You can spot the sway it had on films that used the location of San Francisco so well. Certainly, six years later in Peter Yates’ Bullitt and the decade to come with Don Siegel’s Dirty Harry. For that latter film, notice how the same Catholic Church in a certain part of the city was used in both pictures. And, singularly, as the killer ran back into the emptied Candlestick ballpark, was also revealing. The chase down of “Red” Lynch there will later recall Harry Calahan’s scene with Scorpio at the old Kezar Stadium in the 1971 work, especially in the aerial pull away shot, much like Blake Edward’s film used for its close. 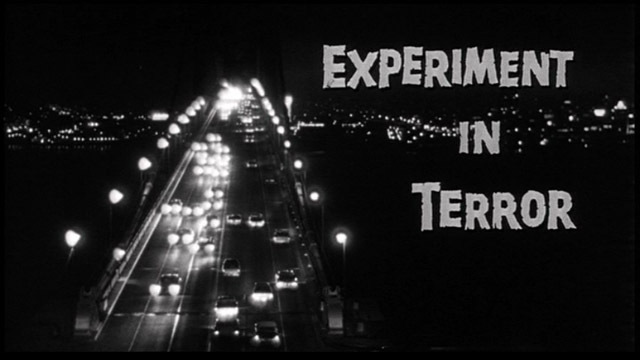 Experiment in Terror was an ahead-of-its-time film, even if its noirish roots paid homage to the genre’s past, I’d say. It wasn’t a mystery so much as a study of terror and suspense cloaked as a police procedural, and one with a decidedly different point of view. Note the number of close-ups director Edwards used so well in this. Everything is played out on the principals’ expressive faces (pre-dating Jonathan Demme’s heavy use in Silence of the Lambs by decades). And still terrify the hell out of you without a trace of gore, blood, or gratuitous violence, comparatively. As well, keep this last thing in mind. Even as cold-blooded as the killer appeared in the film, the why and what he was did it for offered a character twist few in the day ever put forward (even that villainous asthmatic rasp). Filmed beautifully in black and white, it remains a movie that reveled in the darkness and shadows, and used them to create some of the most breathtaking and unsettling moments of the era. Note: for another fine perspective on this film, I highly recommend my blogging colleague Colin and his excellent examination. Well done. I particularly like the way you draw in the forward looking aspects of the movie. Great stuff. Thank you very much for the kind words, Colin. And I look forward to your upcoming piece on this film, too. Great writeup Michael! “…And still terrify the hell out of you without a trace of gore, blood, or gratuitous violence, comparatively.” I think for me, the less is more rule applies to horror/thriller, so I’m more inclined to watch those where things aren’t blatantly displayed on screen. That’s why I like The Sixth Sense and Road to Perdition, what you DON’T see can be even more suspenseful. Btw, Lee Remick is also in The Omen right? Did she do mostly horror films? Oh, and regarding Lee Remick, she was a very versatile actress and performed in a number of genres. I think her work in this film, and as the alcoholic wife of Jack Lemmon in ‘Days of Wine and Roses’ said a lot of her talent and range. LM was something special. She was, in fact, nominated for a Best Actress Academy Award for her performance in DoWaR. I also recommend her work in Otto Preminger’s ‘Anatomy of a Murder’. Thanks, Ruth. Oh right she was in ‘Days of Wine and Roses.’ I remember that now from Jack’s post on Mr. Lemmon. Thanks Michael! Thank you, Morgan. Some of Blake Edwards more dramatic works shouldn’t be missed. This one and ‘Days of Wine and Roses’, especially. I’ll keep them both in mind, then. Thanks, Michael. Fascinating stuff -and I never made the connection in the Badalamenti theme music which is certainly there – great review, cheers. Welcome, Cavershamragu. Thank you so much for the read, comment, and follow. Great review. I enjoyed the in depth examination. Definitely puts me in the mood for a rewatch. It’s been a long time and I’m sure I’d appreciate it more. Hey Michael, I still haven’t seen this (didn’t manage to get hold of a copy before we went out of town) so I’m skipping the review until I do. I have no doubt it’s wonderful as all your reviews are! I’ll be back! I’ll be here when you do :D. Thanks, Rachel.